As a mommy, I will never forget the moment that Big. N. had his first teeth pop through! He was exactly 7 months old and he had not one or two, but SIX teeth pop through his tiny little gums. It explained the random grumpiness we had been seeing from him. Immediately, we were aware that we needed to take action to protect and care for these shiny little gems and help alleviate his teething pain. Since that very moment, we have relied on an arsenal of teething and oral care products. 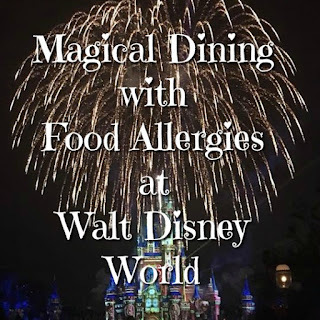 Many of our favorites are from Hyland's! Hyland's is celebrating National Tooth Fairy Day on February 28th with lots of fun stuff! Hyland’s will launch a social networking giveaway on February 28 that will enable 2,000 fans to receive free Hyland’s Baby Teething Tablets (40ct) from Hyland’s. And on top of that fun giveaway, they will also be awarding more oral care boxes to 50 lucky fans who enter to win on their Hylee’s Tooth Fairy page on the Hyland’s Baby Website. The fun doesn't stop there! You will also be able to download fun teething items including a First Tooth Certificate, Tooth Chart and Teething Tips Coloring Sheet featuring Hyland’s own tooth fairy, Hylee. Be sure to learn something new as you find tips for how to approach oral health care from teething to toddler years from several other wonderful sponsors. Ready to Learn More? Visit the following links to learn more and enter these fun giveaways! Exclusive Giveaway for Savy Mommy Moments' Fans! Learn more about some awesome oral care and teething products from Hyland's and other sponsors and then enter to win them all! We all know how much babies love to grab and chew. For that reason, most Moms don't wear jewelry when their children are small. We are changing that! Teething Bling is the original teething jewelry. Made from the same FDA-approved silicone as most teething toys, Teething Bling looks great on the adult wearer but is completely safe for baby to handle and chew. Its soft and flexible, chemical-free, non-toxic (no lead, latex, phthalates, BPAs, PVCs) It's a very simple, clever design that Moms absolutely adore. 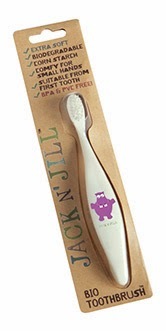 Jack N' Jill Biodegradable Toothbrushes come in two ergonomic designs (Hippo and Bunny) and are made of Cornstarch.They are comfy for young hands to hold and the bristles are just the right softness to be gentle on young gums, yet help clean effectively. The toothbrushes have a Cornstarch handle and recyclable nylon bristles. Simply snap off the head and place it in recycling and compost the handle—it will break down in a home compost within 2 years!! If you don't have a compost you can simply push it into the soil in your garden and use it as a plant stake or herb sign! 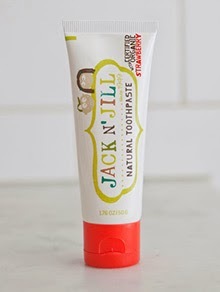 Jack N' Jill Natural Toothpaste with Organic Strawberry Flavor and Organic Calendula is suitable from six months of age and safe to swallow. It’s rich in Xylitol and flouride, sugar, color, SLS, preservative and mint free. Organic Calendula helps to soothe young gums and Organic Strawberry flavor makes it taste YUMMY- a great way to introduce "tooth brushing", develop good habits and make it fun! Jack N' Jill Natural Toothpaste is made in Australia. 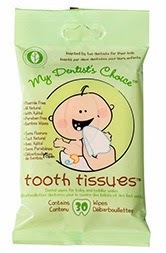 Tooth Tissues™ are certified all natural, unflavored dental wipes for baby and toddler smiles. They contain xylitol and are paraben free and are unflavored, because babies do not need to be exposed to artificial flavors. As practicing dentists, Drs. Grace Lo and Jonathan Korn know the importance of cleaning babies teeth and gums after feedings and before bedtime. As parents they found that it was not always so simple. Tooth Tissues™ are the results of their efforts to find a simple pleasant way to begin good oral hygiene. You will find that they are a convenient yet effective way to comply with your pediatrician or dentist's recommendation for wiping your babies and toddler’s gums and teeth. Giveaway: Open to all U.S. Resident's 18 and over. Giveaway closes at 11:59pm CST on 3/10/14. 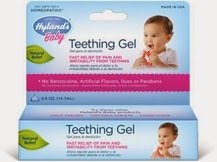 I would like to try the Hyland's Baby Teething Gel. The Vitamin C tablets. I didn't know they made those! I really want to try their teething tablets. My son is 6 months and teething, so now would be a good time! I would like to try the Infant Earache Drops. Being supervised by a medical practitioner, this can be the safest variety of teeth bleaching whereas conjointly the foremost overpriced, for more information click here dentist north lauderdale. 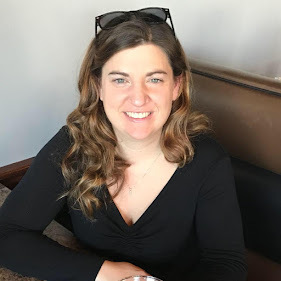 Nice blog.I was very pleased to seek out this internet-site.See more PORCELAIN VENEERS IN HOUSTON TX Porcelain Veneers In Houston, TX,For the solution of such problems, the technique of veneering is available in Houston Call 832-786-4406, well to provide.